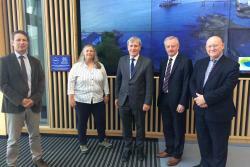 Researchers at the school have been working with partners in Ireland on two partnerships focussing on the shared Irish Sea. The €5.5M Bluefish marine science partnership is investigating the effects of climate change in the Irish Sea on the sustainability of fish and shellfish, while the €1M ‘Irish Sea Portal Pilot’ should provide both fishermen and scientists with a better understanding of how shellfish larvae travel around the Irish Sea, and when and where they can be found. Both projects are funded with support from the EU’s Ireland-Wales co-operation programme. Mr Mulhall also met some of his Irish compatriots working here at Bangor University and met Arfon MP, Hywel Williams, who had visited Ireland with a Plaid Cymru delegation recently to explore and strengthen the historic link between Wales and Ireland. Mr Mulhall is currently approaching the end of his tenure as Irish Ambassador to the UK and will soon take up a new post as Ireland’s top representative in Washington DC.